@JustPLayToys provided us with a small Care Bears bean plush and 3 Blind Bags, each containing small, collectible Care Bears figurines. We are saving the small plush to donate, but I did allow the girls to each open on of the Blind Bags which was a fun surprise. They collected the Series 3 Pearlized Harmony Bear and Cheer Bear – Em’s favorite. Collect the rainbow with the Care Bear beans. These bears come in bright colors and the softest fabric. Perfect for collecting and cuddling. Cheer, Share, Funshine and Grumpy. Each sold separately and recommended for ages 2+. They are priced around $7.99 each. They also have medium and large plush bears available too! With the Care Bear Blind Bags, it is a surprise what bear you will get and what pose they will be in. Collect them all with these collector checklists! Series 1 Series 2 Series 3 Series 4 Prices range on these items, so do some research before buying. You can find Just Plays toys at Walmart, Toys R Us, Target and Amazon too! @vandorllc provided us with a Care Bears-themed shopping tote. Bring a little fun into your weekend errands! Head out with their eco-friendly shopper tote. Perfect for shopping, toting or even a fun alternative to the traditional gift bag, totes feature your favorite iconic characters of fun and friendship. It’s durable, weather resistant and made from 25% recycled materials. We’ll be using it as a gift bag for an upcoming birthday party! You can find it on Amazon. @Bendon_Inc provided us with a Care Bears small character art case. Each art case contains 12 crayons, pencil, pencil sharpener, 6 colored pencils and a paintset and brush. We’ll be adding this set to our road trip travel box for the girls to use on our next road trip. Having items like this on hand keeps them busy and entertained on long drives. Find it on Amazon. Montco Crafts provided us with a Pop-Outz Care Bears Grab-Bag. It contained 2 coloring boards, 3 markers and 25 stickers. Just Color, Pop & Play! First you color the characters, then you pop them out of the board, and you can play with them. Another great item for our road trip travel box!!! @LionsgateAtHome provided us with their Care Bears “Bearied Treasure” DVD. AHOY MATEY! Join the Care Bears for adventures on the high seas and quests for treasures of friendship, fun, and teamwork! Including two new Welcome to Care‑a‑Lot episodes: “Bearied Treasure”, “When the Bear’s Away”, plus two bonus episodes. You can find it on Amazon for $9.99. After the girls picked up all their toys I treated them to some TV time in my bed as we cuddled and watched the Bearied Treasure DVD – TWICE. @good2growdrinks provided us with a juice and one of their Care Bears spill-proof juice toppers. With no added sugar and nothing artificial, good2grow 100% Juices, Fruit & Vegetable Blends, and Juicy Waters are packaged to please! Now available with your favorite Care Bears tops. Reusable and BPA Free. You can find multi-count refill packs on Amazon or at your local grocery store! Typically when I take the girls food shopping with me I treat them to a new topper with a juice to enjoy while we are shopping. What cute items. 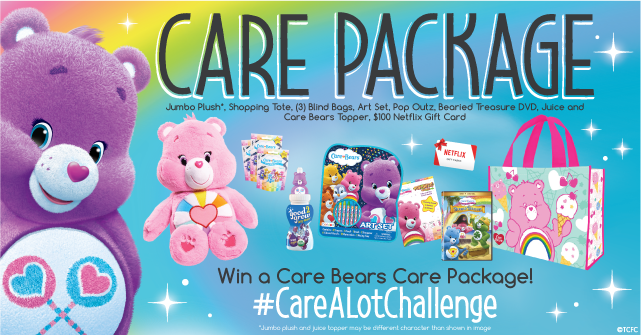 We love the Care Bear collection and love giving these as gifts to the kids! I missed it!! I am new to joining Twitter Party’s, hoping I can join next time! !